[Satnews] LISA Pathfinder, a European Space Agency (ESA) science spacecraft, designed and built by Airbus Defence and Space, has been successfully placed into orbit from the Kourou European spaceport in French Guiana. 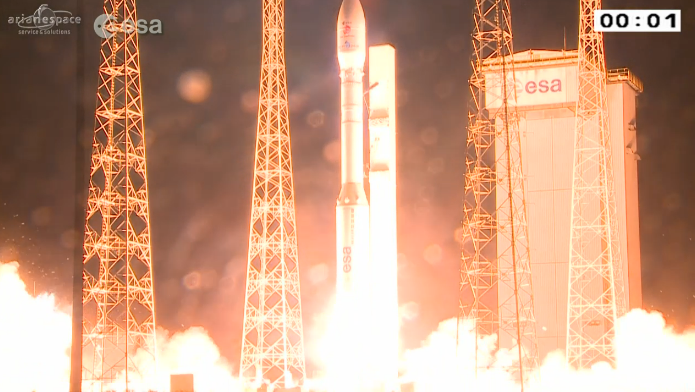 The Vega launcher, operated by Arianespace, flawlessly lifted-off on December 3rd at 04:04 GMT and released LISA Pathfinder, 105 minutes later. Spacecraft controllers in the European Space Operations Centre have received LISA Pathfinder’s first signals. LISA Pathfinder will spend two weeks raising its orbit using a dedicated propulsion module, also built by Airbus Defence and Space, through six separate engine firings. After the final escape burn is performed and the health of the spacecraft module is confirmed, the propulsion module will be jettisoned, approximately 51 days after launch. The spacecraft will continue on its journey to the first Lagrange point (L1) at 1.5 million km from Earth. Its operational orbit is a 500,000km x 800,000km Lissajous orbit around the L1 point. During the drift phase, the platform and the two spacecraft propulsion systems (Cold Gas and the NASA Colloidal micronewton thrusters) will be tested and verified. Twenty-four days after the separation, the mission will begin with three weeks commissioning of the science payload including tests such as the release and capture of the test masses, and verification of the Drag Free and Attitude and Control System (DFACS). This will be followed by the six-month long main mission. LISA Pathfinder is paving the way for a future large space observatory that ultimately will directly observe and precisely measure gravitational waves. ESA selected the gravitational universe science theme for its third Large Class L3 mission, for which a LISA-like mission is a leading candidate. Gravitational waves will allow astronomers to study our universe in a new way, and future telescope systems will be able to observe exotic sources, such as colliding super-massive black holes, as never before.